A Robust New Paradigm for Rapidly Determining Antibiotic Susceptibility. I founded First Light Diagnostics because of concern for two major problems in healthcare: the rise of superbugs resistant to most antibiotics and the epidemic of deadly hospital acquired infections. What is driving the crisis in antibiotic resistance is the fact that antibiotics are extensively overused – they are frequently prescribed when they are not needed and often the wrong one is prescribed. This is a subject I have discussed often, including in an interview with the BBC. Each unnecessary use of an antibiotic hastens the day when bacteria become resistant to it. And the bacteria are developing antibiotic resistance faster than we can develop new antibiotics. Today, as a result, some bacteria are resistant to virtually all marketed antibiotics. Unless we do something, we may be approaching a post-antibiotic world, a world in which bacteria resistant to most known antibiotics are widespread, minor infections are life-threatening, and common surgeries can’t be performed because of the risk of untreatable infections. It is hard for us to imagine this frightening post-antibiotic world – but this is exactly like the pre-antibiotic world up until 75 years ago when penicillin was first available. The greatest risk from antibiotic-resistant infections is to patients in hospitals. 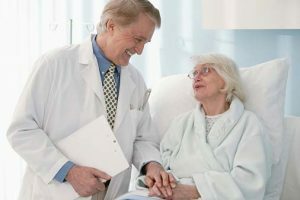 Not only is the patient population the most vulnerable to infection, but the hospitals they visit are where antibiotic-resistant organisms are most prevalent. Every year 75,000 people die of hospital infections in the US – this is more than auto accident and breast cancer deaths combined. Many of these deaths could be prevented, however, if only patients could get the right antibiotic at the first sign of infection. The key to saving lives while not causing the spread of resistance is to prescribe the right antibiotic at the earliest time – and never to prescribe antibiotics when they are not needed. This requires tests that rapidly identify the patients with bacterial infections and that rapidly determine the antibiotic susceptibility to effectively treat them. Today’s tests are much too slow to do this, culture tests can take 4 days to deliver results. First Light’s tests, in contrast, detect pathogens in patient samples in minutes and determine antibiotic susceptibility in hours. First Light’s Multipath™ technology is unique in its ability to rapidly determine antibiotic susceptibility to effectively treat a patient’s infection, to identify all types of disease causing pathogens (bacteria, viruses, fungi) as well as the disease-causing toxins they can produce. Our technology does all this using a digital camera just like the one in your cell phone. This platform consists of an automated analyzer, and a collection of disposable cartridges, one for each major type of infection. A single patient sample goes into the disposable cartridge that simultaneously tests for many different pathogens. At First Light, we envision a world in which antibiotics are not overused so that they remain effective, where patients are rapidly cured by getting the right antibiotic at the outset, and where hospital infection deaths are a rarity.